Divina Galica was a well-known Olympic skier before she started racing, competing in the downhill and slalom at the 1964 Games and again in 1968 and 1972 as the British women's captain. She twice finished on the podium in World Cup events and at one time held the British downhill speed record. After her foray into motorsports she returned to the slopes and represented Britain in a fourth Olympics in 1992. As a driver she began when invited to a celebrity race, surprising onlookers with her natural talent. From there she moved to karts, Formula Two, Formula One and finally sports cars and trucks. 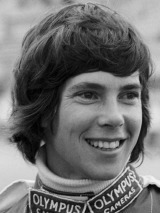 In 1976 she was entered for the British Shellsport International Group 8 series and after some promising performances, Nick Whiting decided to enter her for the British Grand Prix. It was the first time in 13 years a car with the No. 13 had been seen at a race. Galica failed to qualify. In 1977 she drove an underperforming and underfunded Surtess in the British series, nevertheless managing a couple of podiums. In 1978 she signed for Hesketh Racing but again struggled with a poor car and failed to qualify for either of the Formula One races she entered; she immediately returned to the British Shellsport Championship, now a fully-F1 series. She moved on to the Thundersports S2000 sports car class, taking a number of top ten finishes, and truck racing. Galica became an instructor with Skip Barber Racing Schools, rising to become senior vice president.